Designed to fit in as part of any modern kitchen, the Bosch KGV33XW30G Fridge Freezer is host to a wide range of features that make storing your food, both fresh and frozen, a hassle-free experience. Standing tall with a classic white design, this Bosch fridge freezer will take pride of place in the kitchen while offering up plenty of room in which to safely store your groceries. A large salad crisper, with adjustable humidity controls, helps to keep your fruit and vegetables looking and tasting their best for longer. 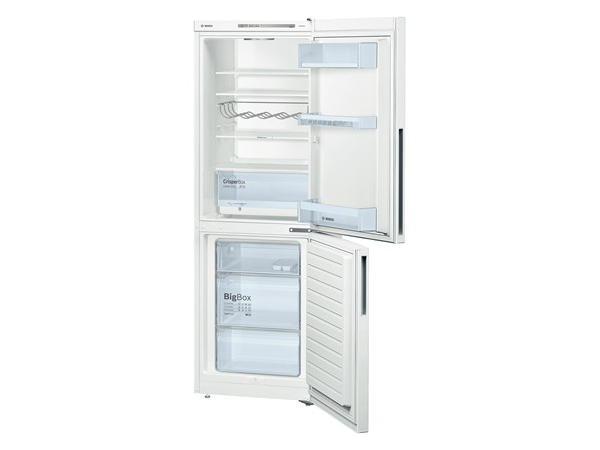 The freezer compartment has a storage capacity of 94 litres, which is split across three clear plastic drawers. A BigBox design ensures there's plenty of space for even over-sized items, such as a Christmas turkey, while LowFrost technology works to ensure that icy build-up is cut by half, saving both time and energy. A fast freeze function allows you to rapidly lower the temperature and freeze items quickly - perfect for when you're placing new items into the freezer. With an energy efficiency rating of A++, you needn't worry about the KGV33XW30G running up the electricity bill and, providing further peace of mind, this fridge freezer comes with a two year manufacturer's guarantee. An ideal way to keep your perishables and frozen foods in top condition, the Bosch KGV33XW30G Fridge Freezer is a fine example of modern refrigeration technology at its best. The large refrigerator compartment delivers a total of 194 litres of storage capacity and provides ample room for your weekly shop. Four safety glass shelves and three door balconies make it easy to stack and store your fresh items and a bright LED light illuminates the interior of the fridge and provides even and energy efficient lighting. A large salad crisper with adjustable humidity controls helps to keep your fruit and vegetables looking and tasting their best for longer. 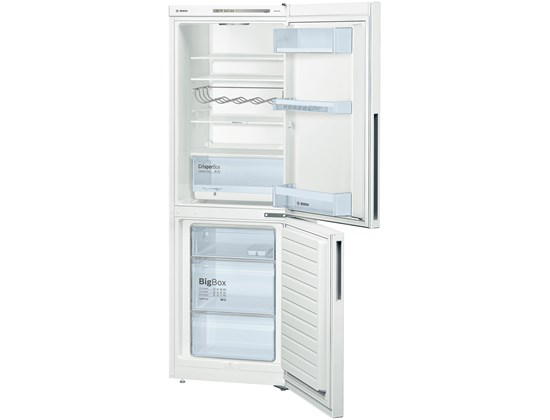 The freezer compartment has a storage capacity of 94 litres, which is split across three clear plastic drawers. A BigBox design ensures there's plenty of space for even over-sized items, such as a Christmas turkey, while LowFrost technology works to ensure that icy build-up is cut by half, saving both time and energy. A fast freeze function allows you to rapidly lower the temperature and freeze items quickly - perfect for when you're placing new items into the freezer. With an energy efficiency rating of A++, you needn't worry about the KGV33XW30G running up the electricity bill and, providing further peace of mind, this fridge freezer comes with a two year manufacturer's guarantee. This refrigerator is not designed to be used in an outbuilding – both your food and the appliance can be damaged. Do not use it in any unheated area. This appliance has a reversible door. Please consult our Knowhow team or a qualified installation expert to carry out door reversal - select the door reversal service when you add this product to the basket.